Nobody wants to have spine surgery, but it is sometimes necessary. Naturally, trying alternative remedies and treatments is always the first course of action. If you have experienced neck pain for some time and you have followed the available treatment options but the results you were hoping for haven’t been forthcoming, then you may need to have surgery. Most people who are referred for this surgery have a lot of questions, however. The most common question asked is “how long does it take to recover from neck surgery?” The reality, unfortunately, is there is no clear-cut or straightforward answer to that question. The neck is very sensitive and highly complex, so neck surgery recovery time will vary depending on your physiology, the kind of surgery that is performed, and more. Of course, you may feel quite concerned about this, but so long as you follow the instructions of your surgeon, you should be able to experience full recovery. Below is some information that is designed to help you understand the procedure, how soon you can expect to recover, and what you can do to make your recovery go by quicker and with fewer complications. When Do You Need Neck Surgery? It is hard to determine whether or not you need neck surgery. This is because it is down to a lot of different factors. For instance, you may find that the discs in your spine are breaking down, causing them to grind together. Cervical radiculopathy, which means that the root of the nerve is pinched by a herniated disc. This leads to bone spurs, which irritate the nerve. Spinal stenosis, which means that the spaces within the spine are too narrow. This will then cause the spinal nerves to become compressed, leading to numbness and pain. Degenerative disc disease, which means that the discs press together, pinching the spinal nerves. In this condition, your discs will also be brittle. This means they are no longer able to stop the vertebrae from grinding together, leading to significant pain. The appropriate neck surgery recovery tips will vary depending on which condition you have. Depending on the cause of the neck pain, different surgical procedures are available. In almost all cases, however, the surgery will allow a specialist to get to the root of the pain, identifying the problem, taking that out if appropriate, and replacing it with an implant, device, or other tool to prevent the pain from returning. Typically, you will only have to stay in the hospital for a short period of time after having surgery. However, that does not mean you will have recovered as soon as you return home. Rather, your neck surgery recovery time may be significantly extended and you must make sure that you follow the post-operative instructions that your physician gave you so that your wounds can heal. In most cases, surgery is performed in order to address problems with one or more nerves within the spine. The spinal cord contains many different nerves at each level and they may become irritated or compressed if there is an abnormality within the spine. Usually, this is down to an issue with your discs, which are jelly-like, soft structures within your spine, effectively cushioning the bones that make up the spine. They can be displaced or they can degenerate, which in turn causes irritation and/or compression on the nerve. Anterior cervical discectomy, whereby the pain of a degenerated or herniated disc is addressed. A surgeon will get to the spine through the front (anterior), taking out the disc in question, and using a bone graft to stabilize the area. Any bone spurs that are touching the spinal nerve may also be removed. Usually, only one overnight stay is required following this surgery. You will be discharged depending on whether you can eat, your mobility, and the extent of your pain. Usually, you will be able to return to your normal activities within three to six months. 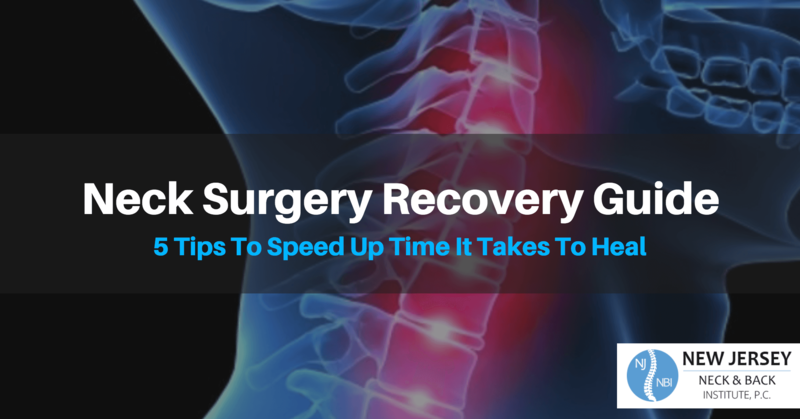 Neck fusion surgery recovery varies depending on how quickly the bone graft is able to fuse. This will be monitored regularly by your physician who will provide you with advice on how to recover and what level of activity is acceptable. Posterior cervical discectomy and foraminotomy, which is quite similar to the previously mentioned surgery because it aims to take out disc tissue that is causing problems. However, with this particular procedure, the disc will be approached through the back (posterior). In addition, no bone fusion will be required as only parts of the disc will be removed. Hence, neck fusion surgery recovery tips are not relevant in this case. Instead, this surgery simply aims to make the space in which the nerve gets out of the spine bigger, thereby preventing compression. It does not aim to improve pathological joints that, through movement, generate pain. Rather, the surgery relieves compression my making more space, thereby reducing irritation of the nerve and reducing pain sensations. Usually, a keyhole incision will be made behind the neck and the nerve will gently be moved sideways, after which the surgeon will clear the space in the foramen. Sometimes, displaced disc material and bone spurs will also need to be removed. Usually, you will have to remain in the hospital for around two days following this surgery. Further recovery will happen over the next four to six weeks, after which you can return to light activities. Full recovery takes around two to three months. You are likely to be put forward for physical rehabilitation therapy as well. Disc replacement or cervical arthroplasty procedure. With this surgery, damaged cervical disc will be taken out and an artificial disc will be put in its place. The artificial disc is a type of prosthetic that works in the same way as a joint, meaning there should be no loss of movement. This surgical procedure is quite similar to the first surgery because the entire disc is taken out and fusion will be required. What is different is the implant, which is a bone graft with the anterior cervical discectomy but a prosthetic device with the disc replacement procedure. In this procedure, a small incision is made to the neck’s front and the soft tissue is pulled aside. Bone material and the disc itself will then be taken out and the surgeon will put the artificial disc in place. The remaining tissue will gently be put back into position and the incision will be stitched. How long you will need to remain in the hospital will depend on your condition, although many do not require an overnight stay. Usually, you can return to light activities around two weeks afterwards and it will take around six weeks to recover in full. Less pain and thereby a better quality of life. Once you have fully recovered, you will be able to resume your regular life, never thinking about experiencing the debilitating pain again. Having neck pain is a debilitating and life limiting condition, but surgery can resolve that issue. Better health. Usually, neck pain is a symptom of an underlying condition that must be addressed. By having surgery, this issue is addressed, thereby stopping it from getting worse. Your age. If you are still quite young, then you are likely to recovery more quickly than if you are older. Younger people usually beat the milestones of the average patient. On the other hand, it is quite rare for younger people to require neck surgery. Your overall health. If you have any other pre-existing condition or live an unhealthy lifestyle, it is more likely that your recovery time will take longer. The healthier you are at the start of the procedure, the shorter your recovery time will be. Things such as smoking, being overweight, drinking to excess, and having chronic illnesses all impact negatively on how long it will take your wounds to heal. Your lifestyle. Those who lead an active lifestyle and engage in regular healthy physical activity tend to recover quickly. Those who have very demanding, physical jobs, however, tend to recover much more slowly. If you are highly active, it will usually take you longer to get back to that level of activity as well. Surgery is always physically demanding, but perhaps never more so than with neck surgery. This is because it impacts the cervical spine, which is the part of your body that is responsible with facilitating movement and supporting your head. Hence, it is very different from a broken arm, for instance, which only requires a bit of rest and a cast. It is impossible to take all pressure away from your neck after surgery, which is one of the reason why recovery is often somewhat longer than with other types of surgery. 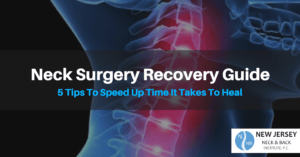 Nevertheless, there are some important neck surgery recovery tips that you can implement to help reduce your healing time as much as possible. You do have to be aware of the fact that these tips are provided as a guide only. In addition, they will not make you magically heal. Rather, they are designed to decrease how much time you need. What is even more important is that you follow the guidelines as set out by your surgeon, who will generally create a program specific to your situation. Let’s take a look at the five most important tips. You must protect the site of the surgery and your spine from undue pressure and that is done by resting. It may be tempting to get back to work or take part in physical exercise again as soon as possible, but that isn’t a good idea. You have to take the time to rest and recuperate because your surgery may actually fail if you overexert yourself. You should not push yourself and when you do return to your physical activities, it should be because your surgeon has given the go signal. Physical therapy. You are likely to have been referred to this therapy after your surgery. Unfortunately, a lot of people will only attend to receive their rehab instructions and then don’t follow them through. If you want to recover fast from your surgery, you need to work at that and that means committing to the program and taking part in your sessions, as well as doing your homework. This will have a huge impact on your overall recovery time. Hydration and diet. You must make sure that your blood is properly oxygenated and full of essential vitamins and minerals. This will enable your blood to move freely and to deliver vital nutrients to the surgical site, helping it to heal. While you may feel like you can lounge in bed and order Chinese food every night, that isn’t a good idea. Instead, munch on veggies and fruits and always have water by your side. This will ensure you stay fully hydrated all day long, fighting inflammation and encouraging your body to recover. A clean surgical site. This can be a little bit difficult if you had a posterior surgery, but if it was anterior, you should be able to keep your site clean with ease. Your doctor should have given you tips and guidelines on how to look after the site and you must follow those to the letter. While we previously mentioned that you have to take it easy and that is correct, it is also important that you engage in exercises that are actually good for your neck. You must make sure that you don’t seize up and that your neck remains mobile and has a full range of motion. Light exercise, such as a leisurely stroll around the neighborhood, will help you to recover much more quickly. Understanding what is making you feel anxious and looking into that more specifically. Properly planning for your procedure. Educating yourself on what to expect. 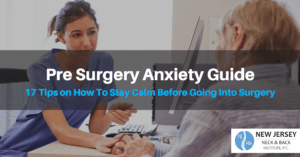 Speakng with your surgical team and support network about your anxieties. Last but not least, it is very important that you look after yourself as soon as the surgery is over. If you want to recover as quickly as possible, you also need to be safe and comfortable. It is likely that your physician will have prescribed you some painkillers and you have been given you instructions on how to look after your wound. You will also have been advised on things you absolutely cannot do, such as engaging in strenuous activity. Your surgeon will also have told you how long you will need to stay off work. Limitations to certain physical activities. Bending over to pick something up or lifting in excess of 8 lbs is generally not allowed. Hence, make sure you have a support network to give you help around the house while you recover. The fact that driving is not allowed for at least two weeks, to protect both you and other road users. The fact that showering should be limited as you do not want any foreign bodies to get into the wound and cause infections. You must give the sutures the time they need to close the wound itself. Again, your physician should have informed you about that. Furthermore, if you have a fever, notice blood or pus from the wound, have difficulty in breathing or using the bathroom, or feel pain or numbness, you must inform your physician. Listening to your body while following the advice of your surgeon is the most important thing you can do to shorten your recovery time. For more information about neck surgery contact our expert spine surgeon Dr. Sandro Larcocca.